British India: Jama Musjid Agra. 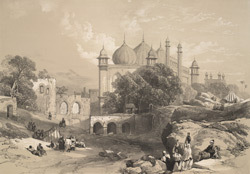 bl.uk > Online Gallery Home	> Online exhibitions	> Asia, Pacific and Africa Collections	> British India: Jama Musjid Agra. Plate 6 from "Recollections of India. Part 1. British India and the Punjab" by James Duffield Harding (1797-1863) after Charles Stewart Hardinge (1822-1894), the eldest son of the first Viscount Hardinge, the Governor General. This illustrates the Jami Musjid, Agra. This mosque was built by the Mogul emperor Shah Jehan in 1648 and named after Jahanara, his favourite eldest daughter, who was imprisoned with him by Aurangzeb. It is raised on a high plinth approached by a flight of steps on the south and east sides. The main elevation has five arched entrances to the courtyard and several small towers and minarets, crowned by three sandstone domes with bands of marble.